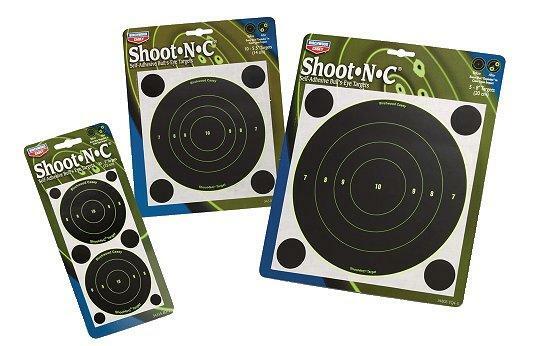 Birchwood Casey Shoot-n-c Targets 5 Pack | Kentucky Pawn, Inc.
Shoot-N-C high-visibility targets enable you to see bullet holes instantly, without the aid of spotting scopes or binoculars. Shoot-N-C is great for use with all firearms including air guns, pistols, rifles and shotguns. Self-adhesive Shoot-N-C targets feature a fluorescent, chartreuse background color with a flat black coating. When hit, the black coating flakes off approximately two times the size of the bullet hole leaving a bright yellow ring around each shot that is visible from long distances with the naked eye. This high visibility makes Shoot-N-C superior for indoor and outdoor ranges, as well as low light conditions.